I don’t think it’s news to anyone that I’m a huge fan of minimalism. Minimalism has enhanced my life so much that I want to share it with anyone who will listen. It has helped me find the answers to some of life’s more important questions like: Will my life be complete without this bundt pan? and How long will it take me to actually use up 82 hair ties? All kidding aside, there are so many wonderful ways minimalism can enhance your life. Although it is often associated with decluttering, once you do embrace the lifestyle, its message of simplicity starts to permeate so many different aspects of your life. 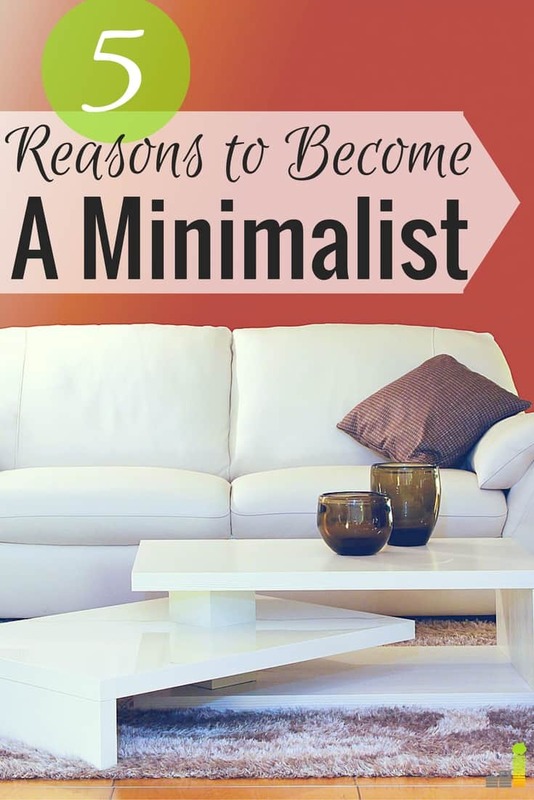 Here are five reasons to become a minimalist. I’ve written at length before about how minimalism and frugality go hand in hand, and that’s because both lifestyles help you save money. With minimalism, paring down actually helps you save money today as well as in the future because you reduce your future need for things. Along with reducing maintenance and storage costs by getting rid of things that no longer give you value, after you’ve pared down and feel the benefits of owning less, it encourages you to think harder the next time you’re tempted to buy something. Do I really need this new widget? Will it add any value to my life? Will I be decluttering this, a year from now? Will it cost me money to store or maintain it? It will help you think constructively and question yourself anytime you want to spend money on future purchases. I really hate cleaning. 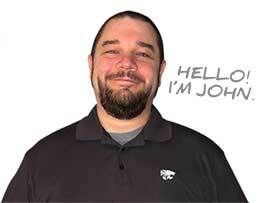 Dusting, mopping, washing dishes, scrubbing sinks and toilets– I could do without it all. Fortunately, owning less stuff means doing less cleaning, and that is a big motivator for me in my path to minimalism. Since I’ve always had a hard time making decisions, I worry myself with decision fatigue constantly, and that’s frustrating and exhausting. Just as financial money management tools like Personal Capital can help you spend less time agonizing over budgeting and investing decisions, cleaning out a closet is a good way to simplify your decision making about what to wear each day. I had a closet stuffed with clothes, shoes, purses, and an endless amount of daily decisions, so I started my paring down process there. Although what to wear in the morning isn’t a big decision in the scheme of things, choosing an outfit out of an overly stuffed closet was yet another decision to make each day that I didn’t really need, so I started getting rid of the clothes that didn’t suit me perfectly. Often times, I would wear the same outfits anyway because I always reached for my favorites, so that made the paring down process relatively easy. Keep your favorites, discard the rest, and enjoy your new simplified morning routine of choosing your favorite outfit to wear everyday. Clearly, the more you get rid of, the less space you need, so if you are renting an apartment, you can downsize into a smaller apartment with a smaller monthly rent. If you own a home, you can sell your house to purchase a smaller home and use the extra money to pay off debt, which is what I did. Let me tell you, it is so worth it. 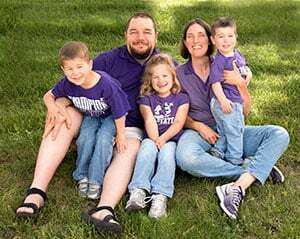 The smartest decision we made was when we downsized from a 2,000 square-foot house with a big payment to a 1,500 square-foot house with a small mortgage that we quickly paid off. Ironically, we now feel like we are swimming in 1,500 square-feet and dream about downsizing even more. We’re all busy, and we could all use more time in the day. When you learn to say no to the invitations to parties and events that you don’t really want to attend, you free up time to spend doing things you actually want to do. When you’re not busy organizing the black depths of your closet for the weekend or cleaning out your car on a pretty afternoon when you could be enjoying the sunshine, you free up a lot of spare time. With a minimalist lifestyle, you can start spending your time with the people you want to spend it with, while doing the things that you are passionate about, because your time is not consumed with taking care of all of your stuff. Take care of your relationships and your passions, not your things. When you start to realize that your identity isn’t housed in the objects you own, it’s much easier to let go of things. You also start to worry less about what everyone else has and you stop trying to keep up with everyone around you, which saves you time and money. In simple terms, minimalism helps you create room for what’s really important in your life, and that has nothing to do with the stuff we surround ourselves with. Could you embrace a minimalist lifestyle? Do you dream about downsizing your home and belongings? 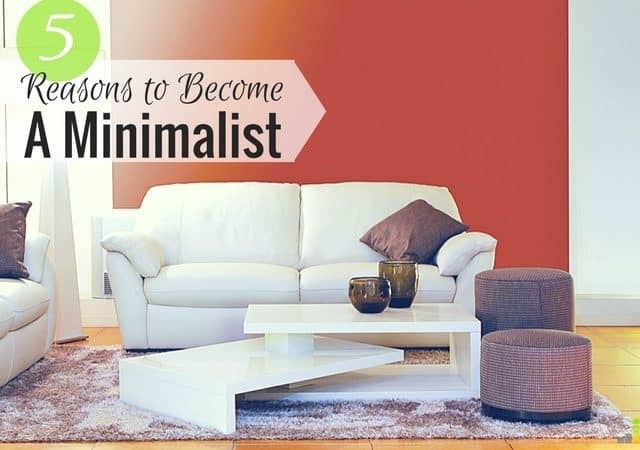 What would you do with your extra time and money if you embraced minimalism? Well, at only 6 years old, luckily she has plenty of time for change. 🙂 The earlier you start, the easier it will be! I believe we can all do with less clutter and stuff around our homes. I currently live in a 1400 sq ft house and would love to downsize that at some point. Someday I will have a tiny house, not one of the sheds you see on HGTV, but a smaller home than my current one. I feel the exact same way– I’m dying to downsize from my 1500 square foot home, but not necessarily to 300 square feet on wheels. I do want a smaller home, though. Minimalism definitely isn’t for everyone! I’m sure we have more stuff than we need, but it isn’t overwhelming or cluttered, except for my daughter’s closet. It seems to have magnetic powers to attract all kinds of clutter. Choose your battles, I guess. We’re minimalists, sort of haha! We live in our RV but our storage unit (that we’re about to put everything in) will definitely be jam packed full of stuff. Another benefit of minimalism is getting rid of clutter. The financial benefits are great, but the decluttering can be a fantastic benefit also. Having less stuff to take care of can free you for so many other enjoyable tasks that you shouldn’t miss any of the stuff cluttering your home. Getting rid of clutter is the number one reason I started this journey. It’s just gone on to change so many other things as well. love this article! love a clean, uncluttered space! reading the comments, it’s interesting that some people are just born with genes for ‘gathering’ – they seem to add extra sentimental value to any and all items. those like us that love it clean and clear of excess are probably NOT adding any personal sentiment to day-to-day possessions, so they are easier to let go. keep up the good work! Thanks, Kim! Adding sentimental value to items basically means that you’re going to feel pressured to keep them for the rest of your life… probably in the attic! I used to place a lot more sentimentality on things than I do now, and a lot of it has been hard to let go of, but I’ve learned to take pictures of things now instead. It has especially come in handy now that I have a kid, and so many things are in danger of becoming sentimental. I do keep a small box of baby things in the attic, but I keep it limited to one box. Love this! Am in complete agreement! My husband and I are currently heading towards a more minimalistic lifestyle. Lots of reorganising and sorting within our house still to do. We are really enjoying the process thus far. I was speaking to a friend several days ago, who absolutely loves to spend. By her own admission, she says that ‘she goes a bit crazy at the shops’. She explained how she’d decluttered many of their possessions that were stored in their garage and sold lots of the items. She said how good she felt after this purging process. I agreed that it feels wonderful to declutter and that it really makes you stop and think before buying anything new, as once you have bought something, you are then ‘stuck with it’ ….there was silence. I could hear the crickets in the background.? It sounds so exhausting to continually buy and then purge items. I am so glad to have broken this pattern in myself. Thanks, Belinda! Congrats on joining the minimalist movement. I can attest that it’s super addictive, and also that it confuses a LOT of people at times. I’ve broken my buy-and-purge tendencies for the most part, but I still have to control myself when I go to Target or a consignment shop (which is why I limit those runs to once a month, maximum.) It’s hard to break decades worth of shopping habits, but it’s so worth it when you have a fatter wallet and a cleaner home. I love everything about it! We have a smaller house and sometimes it can get frustrating not having enough room for all our “stuff,” but I think it’s a blessing in disguise. We don’t over-accumulate, we have a smaller mortgage payment, and our smaller kitchen forces us to not keep buying more and more cups/mugs/appliances. Keeping a small house definitely helps you keep your accumulation of stuff (and finances) in check. This post is so true and I feel so accomplished when we minimize all of our “stuff”. I get excited to go through toys and pack away or donate ones that are just there to create a mess. I also encourage clear kitchen counters. I sometimes find people with a ton of appliances on their counters and that is something I try to avoid in my kitchen. We do have a few small appliances that I keep in the cupboard and because they are not used everyday I am able to keep them out of my way to keep my kitchen clean. I love being a minimalist because I find life easy to live, fun, and exciting. More than that, it makes me feel like it’s easy to save and reach my financial goals. While we aren’t “minimalist” we do focus on living mindfully and being conscious consumers. Probably the biggest improvement to our lifestyle is that we have a lot more time. We no longer spend our time at the mall, online shopping, or researching the next thing to buy. It has really freed up a lot of our time. Last year we embraced living minimal. I can’t tell you how it feels to live so simple. You really have to experience it fir yourself. We went from a 2000 square foot house to 1200 square foot apartment and our lives have changed so much. I’m so thankful we made that decision to sell, giveaway, or throw away some of our stuff. It really does keep stress at bay and more time to do things you love. Thanks, great article. I’ve been living in 800 sq ft or less since the mid 90’s. In the beginning I had a storage unit thinking I would move into something bigger sometime. But, like you said, I mostly forgot what was in there and it just became a burden to me (psychic burden as well as a waste of the rent for the space). I have to de-clutter / springclean and let go of stuff regularly but I wouldn’t have it any other way. That’s the thing about storing so many things– out of sight, out of mind and you realize you don’t need most of it. I keep a dedicated box for things I’m on the fence about keeping, and 99% of the time, I never remember what’s in the box, so every few months, I’ll donate it all.